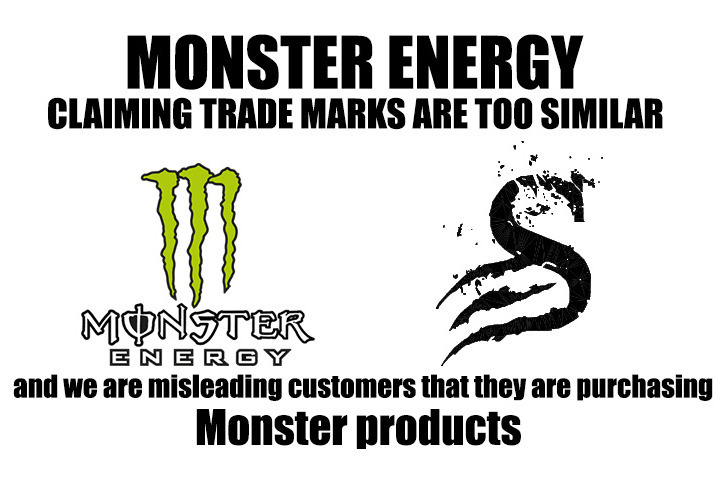 In simplified terms, Monster energy are opposing our trade mark, attempting to stop us from protecting our intellectual property, brand logo and business name. What is a trade mark opposition? An opposition is a formal objection to an action such as the registering of a trade mark...or another party is attempting to remove an already registered trade mark. They may consider a trade mark application which has been accepted is too similar to theirs. A quick Google search shows Monster energy is a ‘trademark bully’. They are notorious in the trademark world for starting more trademark disputes than any other US company over the last few years. They've filed over 1,000 claims since 2010. They devote great amounts of time and money to try to prevent anyone else from using the generic words "Beast" and "Monster" narcissistically pretending to own a monopoly on that part of the English language. Monster has filed an enormous 113 oppositions in Australia to date. Many of these involved trademarks containing “claw marks”, the word ”monster” and logos with similar colouring to theirs . In 38 of those oppositions, Monster has won by default due to applicants declining to contest the claim. The reason for this? 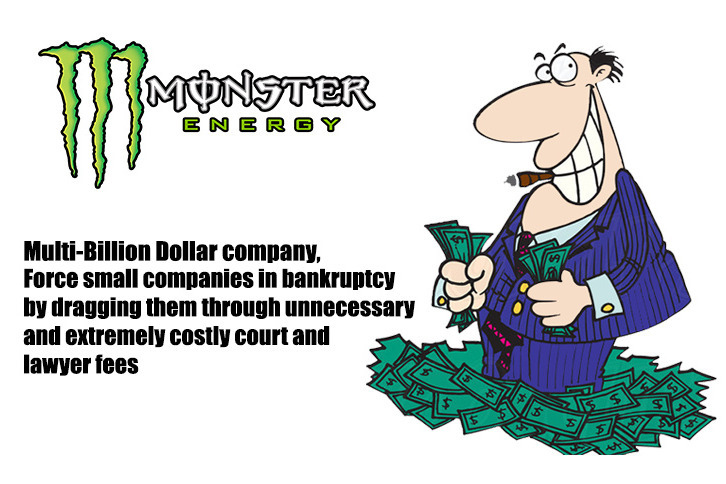 Monster Energy is a multi-billion dollar company that has the ability to force smaller companies in to bankruptcy by dragging them through unnecessary and extremely costly court and lawyer fees. Ironically An Australian Based Law firm who are the ones who profit from putting Australian Business's through this unnecessary hardship. The few small businesses willing and able to hire expensive legal representation are frequently silenced because MEC tends to offer to drop the case or "settle" in exchange for a Non-Disclosure Agreement that effectively silences the victims. Protecting your trademark is one thing, but harassing smaller businesses into submission just because you have deeper pockets is not right. We want to defend not only our own company, but Fight so that other small businesses do not get harassed by Monster Energy. Our hope this will bring this to the public eye so other companies facing the same ridiculous claims will be able to research this issue and see that they have a history of doing this and that it’s possible for the underdog to stand up to these big corporate bullies and defeat them if you’re in the right! to quote our friends at Thunderbeast who have been caught up in a similar case for 3 years. This is about fighting for truth and justice. This is about inspiring others to chase their dreams, and to not be afraid of the bullies standing in the way. This is about knowing there are very real monsters in this world oppressing and hurting people, and if we do nothing to fight them, then who will? Please sign our petition to help our cause! Feel free to leave any comments about your feelings about the matter on our petition via the link below!